Just in time for the EICMA show in Milan, Honda has officially revealed the 2014 CTX1300 to the world press, and it looks exactly like the spy photos we posted on October 21st. While a bit of the surprise has been spoiled, the increased anticipation that has built around the CTX should offset any corporate disappointment from the snafu. Now, with official Honda documents in hand, we can tell you all you need to know about the CTX1300. The CTX1300 is the second bike in the CTX series (Comfort Technology eXperience). Although there are some styling differences from its 700cc sibling, the new CTX clearly springs from the same gene pool, bearing an unmistakable family resemblance. 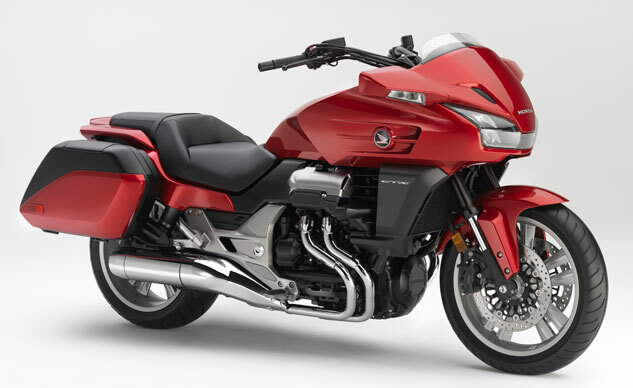 The fairing shape with its shorty windshield and the integrated hard bags reflect the evolution of the CTX. Honda continues its efforts to grow the motorcycle market. 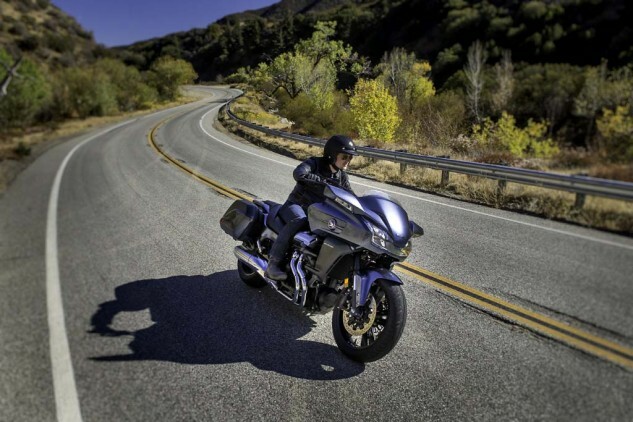 The CTX1300 is the latest bike in the Comfort Technology eXperience line hoping to lure people with the call of the open road. 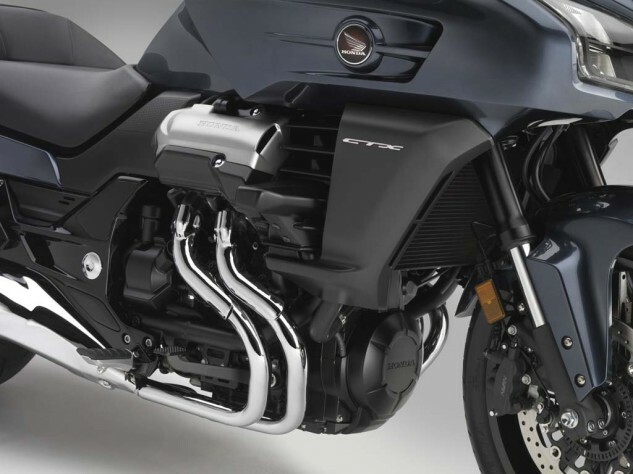 The seat height is a low 29.1 inches that, when combined with the low CG (thanks, in part, to the under seat location of the 5.1 gallon tank), will make it easier for shorter or less experienced riders to maneuver the bike’s 724 lbs. at low speeds. The riding position is relaxed with the pulled-back handlebar giving the upper body an almost cruiserish stance, while the pegs place the feet in a slightly forward from standard position. Passenger accommodations look to be equally comfortable. A ST1300-derived V-4 engine powers the big CTX. Now, just because the engines share the same lineage, don’t expect many similarities. The two engines have very different job descriptions. The liquid-cooled 1261cc longitudinally mounted CTX mill is tuned for bottom-end and mid-range power. While the bore and stroke retain the ST’s 78mm x 66mm figures, new pistons lower compression to 10.0:1. The four valve per cylinder, DOHC nature of the engine remains, but we can assume that the valve overlap has been lessened to aid in the bottom end power. Honda’s goal is to deliver ample motivation from the moment the clutch is released. Not just a ST1300 engine in prettier clothing. The CTX1300 mill underwent major changes in its repurposing for more relaxed touring. In keeping with the easy-to-ride theme of the CTX700, the 1300’s linear power will give sporty performance in a variety of circumstances. Since the CTX is designed for light touring, the five-speed transmission’s taller gearing will keep the cadence low out on the highway. Despite the fact that almost half of the CTX700s sold have Honda’s Dual Clutch Transmission (DCT), the CTX1300 will not have a DCT option. Honda says this is simply a pricing decision, but it seems odd, given the popularity of DCT in the smaller CTX. Final drive is via a shaft. Honda claims the CTX’s handling will be sporty and confidence inspiring. The 28.1-degree rake and 4.5 inches of trail should make the CTX stable, while the wide handlebar will give ample leverage for maneuvering. Suspension duties will be provided by an inverted 45mm fork and preload-adjustable twin shocks. 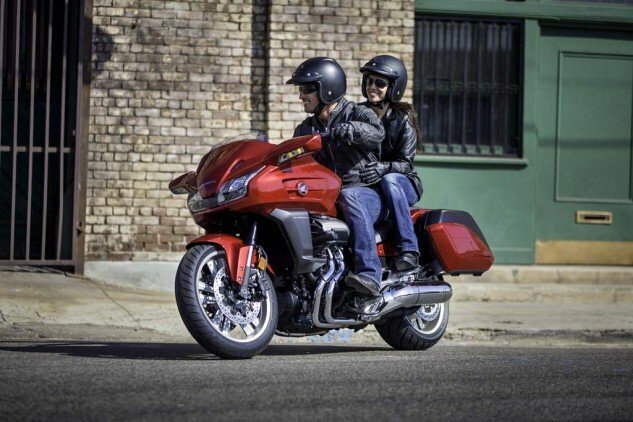 Sporty handling, hard bags, and an easygoing personality were the goals of the CTX1300. The power to slow the CTX1300 will be provided by two 310mm front discs with three piston calipers. The rear will wear a single 315mm disc and (we assume) a three piston caliper. The front brake can be applied alone while the rear will use Honda’s Combined Braking System which applies one piston on each of the front calipers when the rear brake is applied. ABS is an available option. The long, low and beefy style of the CTX1300 is not an optical illusion created by the unique fairing. 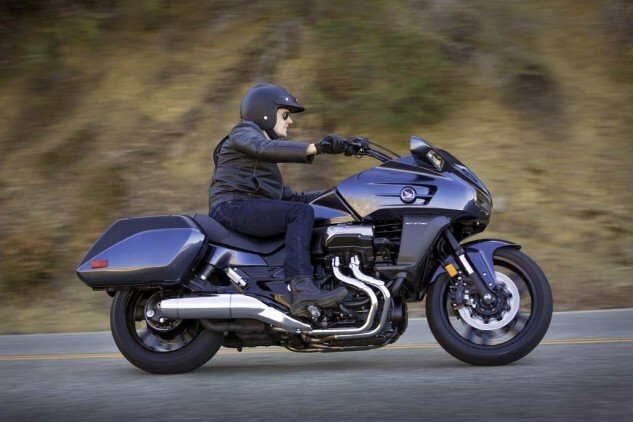 The wheelbase measures a long 64.5 in – almost six inches longer than the ST1300 that supplied the engine and just two inches shorter than the F6B version of the Gold Wing. The effect is augmented by a meaty 200/50R-17 rear tire and the 130/70R-18 front tire. The headlights are Honda’s first LED powered units for brightness and durability and feature LED halo accent lighting for a premium style. The taillight and turn signals also use LEDs. You can identify the Deluxe model by the blacked out wheels and frame components. Two versions of the CTX1300 will be available. The standard model received all the above listed components with an ABS option. The CTX1300 Deluxe adds standard ABS, traction control and self-canceling turn signals. Included also is an audio package with both USB input and Bluetooth connectivity for remote control of your audio device. The visual distinction for the Deluxe comes from blacked out styling accents. The wheels and frame elements around the swingarm pivot are semi-gloss black instead of the base model’s silver. As with any new Honda, a raft of accessories is slated for the big CTX. Highlights include: a tall windscreen, audio package (for the base model), LED fog lights, heated grips, centerstand, rear rack, trunk, and tons of chrome accent items. Although the retail price has not been released, Honda says the CTX1300 will sticker around $17,000. 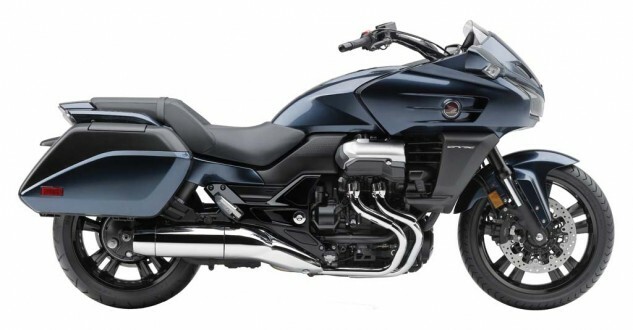 Honda wants to position the CTX1300 as an entry into its premium bike lines, so the price must stay below the F6B’s $19,999 MSRP. No word was given for the Deluxe model. The color options will be Metallic Black, Gray Blue Metallic, Candy Red. Expect dealer availability in March 2014. Even without the blurred faces of the spy shots, you should recognize this happy CTX1300 riding couple. Get price quotes for Honda from local motorcycle dealers.